Winter evenings can get pretty chilly without a roaring fire and a warm blanket. And now with the Empire DVCC42BP32N Tahoe Direct Vent Fireplace, you can have the comfort and warmth of a wood-burning fire without the mess. 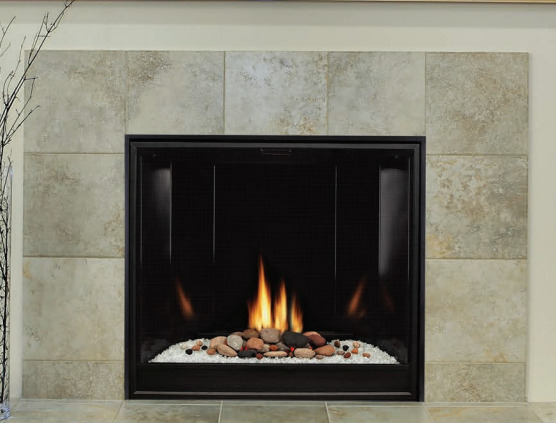 This natural gas fueled fireplace uses a ready-remote millivolt ignition. It creates up to 30,000 BTUs of heat which can be blown throughout your living area. The clean, contemporary 42-inch face and the required decorative crushed glass and rock set (sold separately) offer a modern decoration which compliments just about any type of living area decor. So you can enjoy a warm living area and a beautiful centerpiece! What is the material on the bottom below the rocks? The material pictured below the rocks is crushed glass.